You’d be surprised to know that the majority of amateur games end the way they do because of a blunder from one or another side. If your rating is below 2200, the chances are you are in the same boat. By simply reducing the number of blunders you can grow significantly as a chess player. In today’s article, I will give you 7 easy to follow tips that will dramatically reduce your blunder rate. The single most effective way for reducing the number of blunders in your games is double checking the moves. It may sound obvious, but surprisingly many players do not do that. They think they’re double checking the moves, but they don’t do that after every single move. After playing 10 moves, double checking it over and over again and not blundering these players gain confidence and stop checking on move 11 or 15 or 25… It happens sooner or later. And that’s where the danger is. They stop double checking the moves and they blunder without even realizing why it happened. To make long story short, double check all of your moves, not just some, to save yourself from blunders. 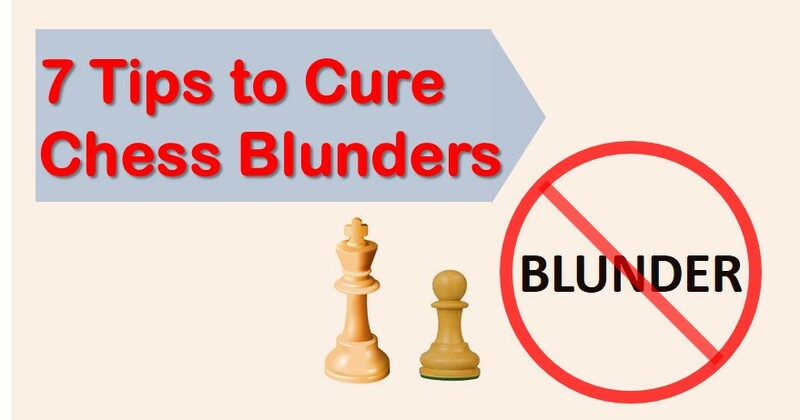 The second tip for avoiding blunders is asking “why” that move was played in a first place. Unless you are playing a complete beginner all his moves have purpose, a little idea the move is meant to accomplish. Your goal as a chess player is to figure out that idea. If you do, you will be able to reduce the number of threats and avoid many traps set up by your opponent. How many times you’ve played an instinctual (aka automatic) move and resigned 3 moves later. There are no obvious moves at chess that do not need to be thought about. The sooner you realize it, the less blunders you will commit. If your instinctual move problem is a serious one, I recommend one method that is typically used to train young players. Sit on your hands when playing chess, and make sure to take at least 30 seconds per move, even if it appears to be completely obvious one. That way you will train yourself to always think before you move. That alone will save you many games. Ready to stop blundering and start winning? Many blunders come due to lack of player’s tactical awareness. It simply means that a player is not aware of certain tactical motifs or simply overlooking it. In order to get rid of this problem I recommend solving tactics on daily basis. Make tactics solving a part of your training routine and you will notice your blunder rate dramatically decrease. Another source of blunders comes from calculating the line not sufficiently deep. You may think that you are facing a winning combination so you commit to the sacrifice. But if you calculate just a move or two deeper, you will learn that this line is actually a losing one. But you don’t know that, because you saved yourself some trouble by not calculating these 2 extra move. You play the sacrifice and eventually lose the game. To save yourself from this very common scenario, make sure to calculate just a move or two deeper than you think is necessary. Trust me that will pay off in the long run. You’d be surprised to know that a chess player is more prone to making a mistake when he is actually winning the game. At that point, he starts feeling good about himself, relaxes and eventually loses focus. When that happens, he blunders and loses rather quickly. I’m sure you don’t want to lose a won game. Remember to always stay focused until the very end. If your opponent just lost his queen the game isn’t over yet. It is only over if you have checkmated him, he resigned or flagged. Keep that in mind for your next game. Many chess players blunder, get upset and resign right away. Little do they know if they take a few minutes to think what has happened, they may still have a chance of saving the game? When you make a mistake next time, take some time to evaluate the consequences and see if the game can still be saved. The chances are you can still save at least 3/10 “lost” games if you play right.